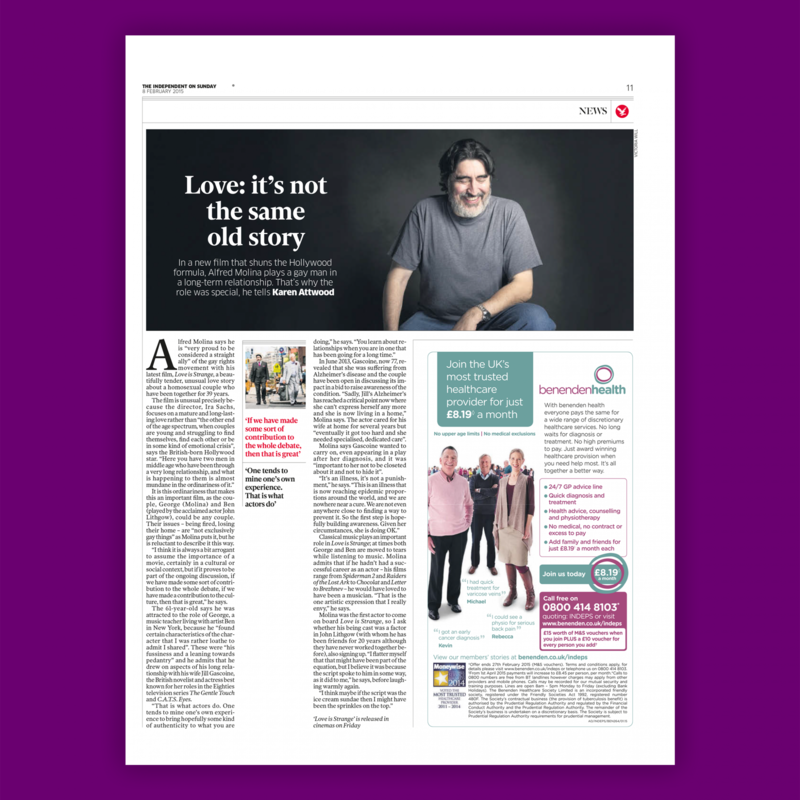 Alfred Molina says he is “very proud to be considered a straight ally” of the gay rights movement with his latest film, Love is Strange, a beautifully tender, unusual love story about a homosexual couple who have been together for 39 years. It is this ordinariness that makes this an important film, as the couple, George (Molina) and Ben (played by the acclaimed actor John Lithgow), could be any couple. Their issues – being fired, losing their home – are “not exclusively gay things” as Molina puts it, but he is reluctant to describe it this way. “I think it is always a bit arrogant to assume the importance of a movie, certainly in a cultural or social context, but if it proves to be part of the ongoing discussion, if we have made some sort of contribution to the whole debate, if we have made a contribution to the culture, then that is great,” he says. The 61-year-old says he was attracted to the role of George, a music teacher living with artist Ben in New York, because he “found certain characteristics of the character that I was rather loathe to admit I shared”. These were “his fussiness and a leaning towards pedantry” and he admits that he drew on aspects of his long relationship with his wife Jill Gascoine, the British novelist and actress best known for her roles in the Eighties television series The Gentle Touch and C.A.T.S. Eyes. In June 2013, Gascoine, now 77, revealed that she was suffering from Alzheimer’s disease and the couple have been open in discussing its impact in a bid to raise awareness of the condition. “Sadly, Jill’s Alzheimer’s has reached a critical point now where she can’t express herself any more and she is now living in a home,” Molina says. The actor cared for his wife at home for several years but “eventually it got too hard and she needed specialised, dedicated care”. Molina says Gascoine wanted to carry on, even appearing in a play after her diagnosis, and it was “important to her not to be closeted about it and not to hide it”. Classical music plays an important role in Love is Strange; at times both George and Ben are moved to tears while listening to music. Molina admits that if he hadn’t had a successful career as an actor – his films range from Spiderman 2 and Raiders of the Lost Ark to Chocolat and Letter to Brezhnev – he would have loved to have been a musician. “That is the one artistic expression that I really envy,” he says. Molina was the first actor to come on board Love is Strange, so I ask whether his being cast was a factor in John Lithgow (with whom he has been friends for 20 years although they have never worked together before), also signing up. “I flatter myself that that might have been part of the equation, but I believe it was because the script spoke to him in some way, as it did to me,” he says, before laughing warmly again.